This recipe may be frowned upon if you're a purist but it represents a fantastic opportunity if you're just interested in tasty inspiring and healthy food. 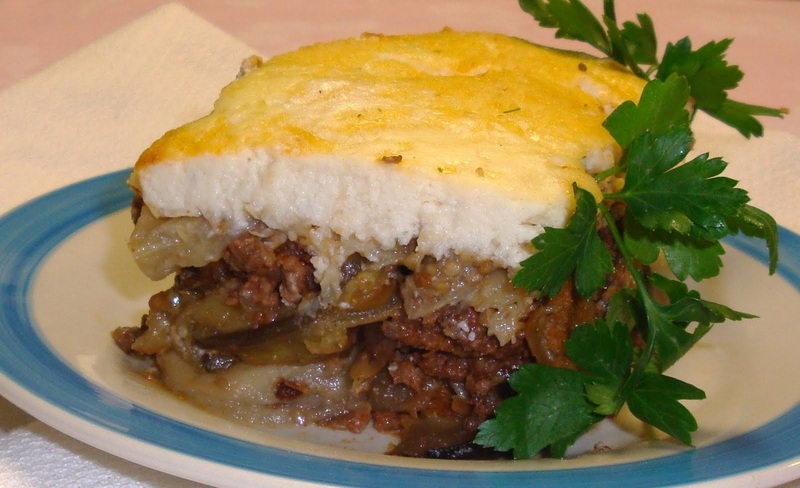 Use your ragout as the basis for a fine moussaka-like dish. 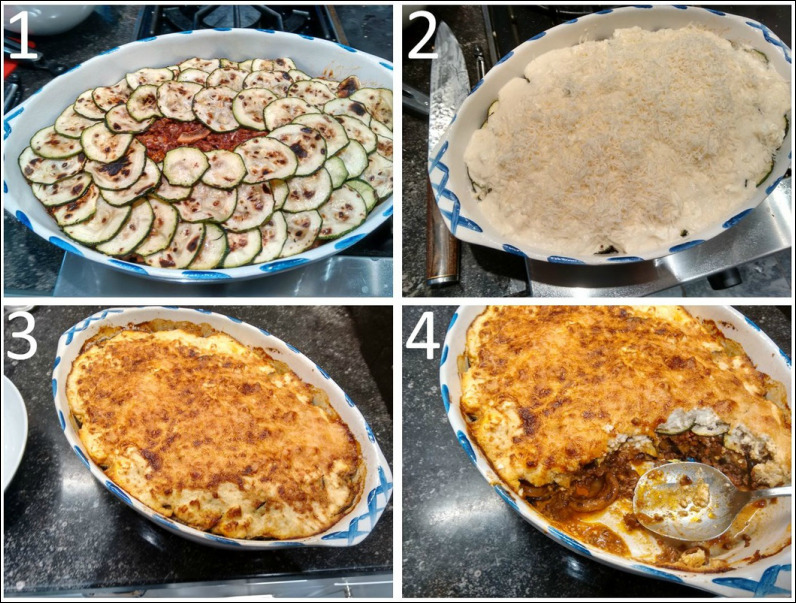 After all, moussaka is not just a Greek dish, its derivation being Arabic, but we usually recognise it by the meat sauce, the aubergines and of course the wobbly bechamel sauce on top. "But doesn’t it have to be contain minced lamb?" I hear you say. Funnily enough, in Greece, they often use a mixture of minced pork and veal, which you can buy easily in butchers shops there or in France and Belgium for example. In the UK, veal is hard to find and some people don't like to eat it, so, on balance, I think it’s fine to use our ragout as a base! The addition of aubergines and spices like cinnamon and nutmeg will add an oriental, Southern European flavour soon enough. Follow the recipe for hollandaise sauce and then add crumbled feta cheese and parmesan and melt gently in the hot sauce. No need to boil any longer. More veg in your moussaka? Another great low-carb alternative made in the same vein consists of briefly frying slices of courgettes and aubergines before layering them together with the prepared ragout. The pre-frying with just a spray of olive oil removes water and adds taste for better consistency and flavour. Top off with the bechamel sauce and you have a Southern European moussaka-esque dish that tastes brilliant and stretches the meat further. Because particularly aubergines soak up the oil, it's best to spray them with olive oil before you fry them for a few minutes at a medium temperature. This pre-work is time consuming but essential to getting the dish just right. It's where to begin with many French dishes, that creamy mixture that combines butter with flour to thicken sauces and also provides a starting point for souffles and many hors d'oeuvres. A classic roux is made from 50% flour and 50% butter. They are mixed over gentle heat until they combine and the flour cooks through. The basic version is white but if you cook it for longer, it turns from white to golden to dark... as needed. In this version, we mix in coconut flour as a replacement for wheat flour, increasing the proportion of butter to 2/3 because of the absorbent nature of coconut and cooking gently so as to preserve a light colour. We are on our way to making a béchamel sauce so as soon as it's nicely combined, we add cream, yogurt or milk gently, bit by bit until we have a smooth sauce the consistency of thick cream (add a little arrowroot for a creamier consistency). Stir vigorously as the sauce thickens each time before adding a little more milk, salt and pepper to taste. This reduces the carb load and makes the bechamel gluten-free. The coconut flour is not quite as fine as wheat flour so the sauce can be lightly textured. It also has a light after taste which many people like, but if you don't, try cornflour or one of the gluten-free blends. 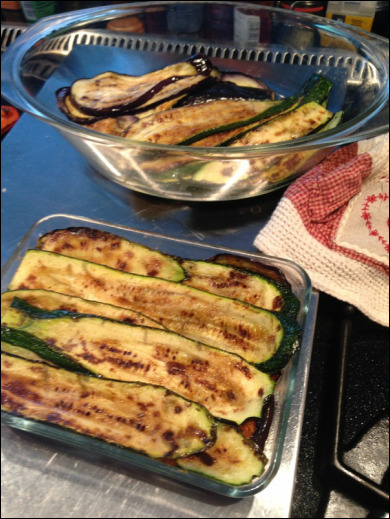 ​ It doesn't matter which way you slice and prepare the courgettes (zucchini) and the aubergines (egg plant); what's important is to sprinkle them with a dash of salt and then give them a quick pre-cook by frying for just one minute per side using some olive oil spray. In this moussaka to the right, I added a little arrowroot to the bechamel sauce to make is a bit creamier (it only adds a few gluten-free carbs), before melting in the feta cheese to taste. ​ Grated parmesan helps give a lovely crispy crust.